When it comes to Jeep suspension, flex is the name of the game. Get the most out of your four door JL Wrangler’s suspension articulation with the Rock Krawler X-Factor Series Max Travel 3.5" Lift Kit. The X-Factor Series Max Travel Kit has all the features of the X-Factor Series Flex System, with the addition of X-Factor adjustable rear upper control arms. This complete bolt on system was designed to add 3.5” of lift with minimal maintenance yet optimal durability. Rock Krawler uses triple rate coil springs for ultimate performance under any load. Triple rate springs are great for highway driving, off-roading, and towing. The X-Factor Series adjustable lower control arms have up to 90 degrees of misalignment for ultimate flex. Rock Krawler includes geometry correction wedges for both the front and rear springs. These spacers eliminate spring bow caused by lifting Jeeps. X-Factor Series: What sets Rock Krawler’s X-Factor lifts apart form their other kits are their adjustable control arms. These arms offer a total of 90 degrees of misalignment without binding. 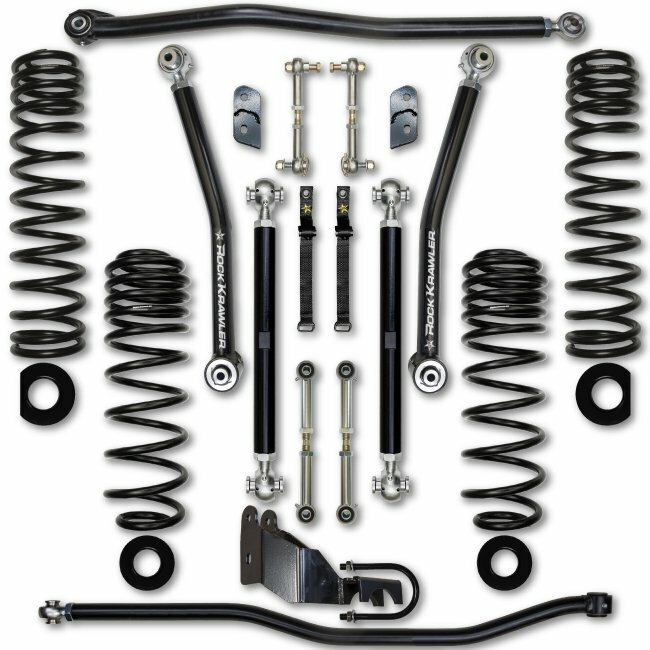 Complete Bolt-In Kit: All of the included components have been designed to install with no drilling or modifications to the Jeep. Each part has been tested for quality and fitment to ensure the best ride on any terrain. Triple Rate Coil Springs: Rock Krawler triple rate coil springs are designed to handle any condition under any load. They work great for towing.